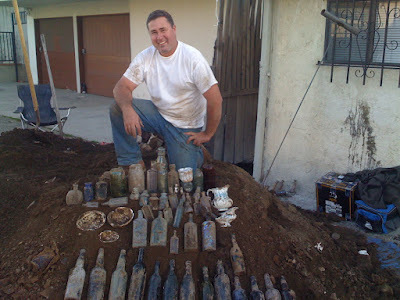 Nothing heavy....just some fun finds from digging the outhouse for an old M.E. Church. Below is a Mason jar with more olive-amber colored swirls than a bag of candy-canes. Also pictured is a pretty tough Hutch soda from a neat little Southern California town. A little bit of everything seemed to come out of the hole: bottles of all types, shapes, and colors; not to mention the huge abalone shells, porcelain dolls, and other trinkets. This church was a drinkin,' as evidenced by the numerous beer, ale, champagne, wine, and liquor bottles we found in the double-seater privy hole. Your right -they don't have to be loaded up with rare bottles to be fun. But... you never know what's in the next pit til you dig it. What's that bottle you have hidden by the garage door? 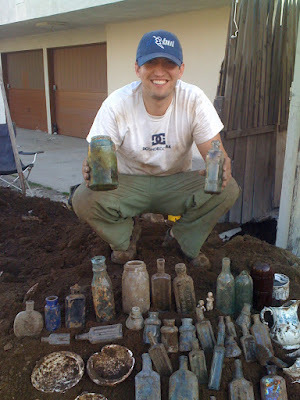 Great dig, looks like a few of those bottles were getting close to the right age !! I'm guessing that church was one of the oldest structures in the area and should have another pit ? The age was turn of the century to teens in the first 2-3 feet (crown tops and tooled tops). The earlier age (mostly mid 80's) was right on the bottom 1/2 foot, and not as loaded as the newer layer was. We found a broken Los Angeles Hutch (earliest variant) with the top knocked off, a western star-based pickle jar, and an aqua western blown California fig syrup. One of the "newest" bottles is a base embossed soda bottle with a crown top...but I won't go into futile details in reverence of the Western Bitters blog. Funny how church holes can be nothing you expect them to be. Dug a double seater of a 1871 Mormon Church in So Cal recently. It spanned the 80s through 90s, but only produced five bottles: one ink and four slicker booze bottles. Hallelujah and pass the bottle! I think I might just know which Mormon Church hole you are talking about...especially since there are so few SoCal towns with that kind of age and a Mormon Church to boot. I'd be interested to see for sure if it is indeed the same church I am thinking of. Is it somewhere near the merging of Hwy's I-215, I-15, and I-10? Yep, San Berdoo. You're right, not many other options for So Cal when considering an 1871 Mormon Church. They actually first settled there in 1851. To keep this on topic for bitters--dug a broken Wormser barrel last month down here. Hey, don't laugh, that's exciting for us So Cal'ers--even if it's a broken one!